Best known for ultrapopular cartoony images of cutesy little children and animals, Yoshitomo Nara, 50, can be perceived in two basic ways: as a purveyor of mass-produced kitsch, from dolls and ashtrays to bookends and rugs, or as an avant-garde practitioner of the first order, expressing the angst, isolation, anger and frustration felt by young people in his native Japan and in other parts of the world. The mid-career survey currently at the Asia Society, “Yoshitomo Nara: Nobody’s Fool,” makes a strong case for the latter. Curated by the museum’s director, Melissa Chiu, and associate director, Miwako Tezuka, Nara’s U.S. museum solo debut contains over 200 works in a variety of mediums. In “Nobody’s Fool,” titled after a 1970s song by Dan Penn, the curators emphasize the influence of pop and rock music on Nara’s work; two walls of a gallery lined with covers of some of his favorite albums underscore the theme. 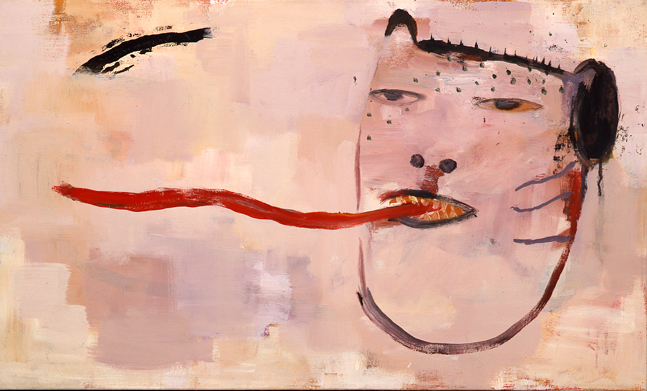 The show features a selection of large (up to 7 by 6 feet), delicately painted canvases of girls with oversize heads; the best among them, such as Gone with the Cloud (2004) and Remember Me (2005), are mesmerizing in person. They show melancholy children whose enormous eyes contain swirling passages of blue and purple that suggest a cool celestial light. Also on hand are examples of Nara’s wildly popular puppy, an ongoing series of over-slick resin sculptures that contrast with a rather funky recent group of large black-and-white ceramic plates and vases. Decorated with roughly outlined facial features and scrawled song lyrics in English, German and Japanese, the vaguely anthropomorphic vessels refer to both rock ’n’ roll and the deep tradition of Japanese ceramics. 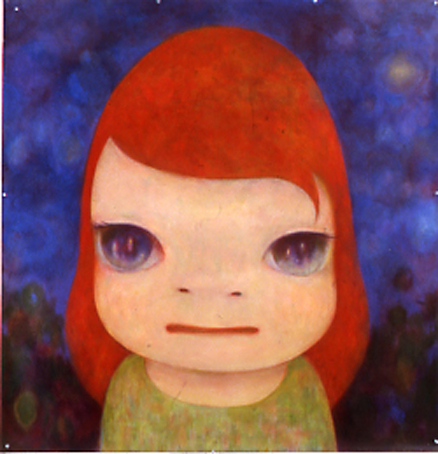 Nara’s work is often linked to comic-book styles of Japanese anime and manga, but the artist, who lived and worked in Cologne and Düsseldorf for 10 formative years beginning in the late 1980s, and studied for a time with A.R. Penck, is well attuned to German neo-Expressionist idioms. A case in point, Nara’s Flaming Head (1989), one of the earliest works on view, is a 62-inch-tall painted-wood totem, featuring an elongated blonde female figure with a crown of stylized flames rising from the top of her head. With its rough-hewn surface and intense color, the work bears an emotional charge like that infusing sculptures by Markus Lüpertz or Georg Baselitz. The feeling of angst in this early piece carries over to the abject works on paper in which Nara developed his trademark image of a solitary peevish or downright angry child. In one work, a young girl with a mischievous grin wears a jacket emblazoned with a peace symbol yet threateningly wields a knife. Another wide-eyed antagonist screams out (by means of speech balloons), “Blitz Krieg Bop—Go! Go!,” alluding to the Ramones’s punk-rock anthem. 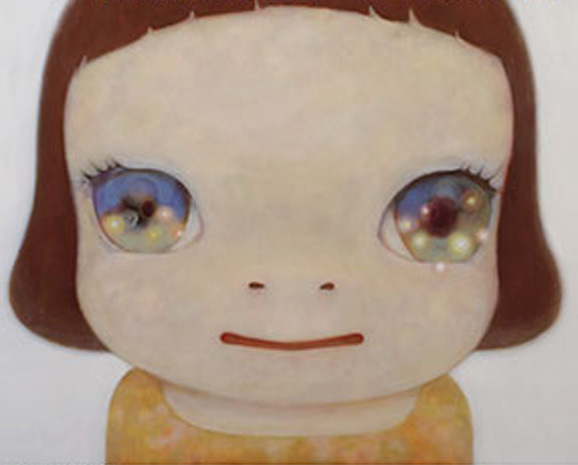 While often compared with the work of his compatriot and onetime roommate Takashi Murakami, Nara’s oeuvre is more introspective and emotionally wrought, as he eschews the gaudy, hypersexualized imagery Murakami prefers. Dramatically illuminating if not explicating Nara’s acerbic childhood vision, several site-specific installations of wooden structures are the highlights of the exhibition. Built in collaboration with designer Hideki Toyoshima and his team, YNG, these found-wood rooms, many of which visitors can enter, often resemble prison cells or dreary enclosures for solitary confinement, with one door ajar and another boarded up. Each room is hung with small drawings and paintings. Nara has stated to the press that the spaces refer to his own lonely childhood, in which he would lose himself in drawing and music to escape his dysfunctional family. In one of the rooms, Nara hung homey curtains and placed at the center a white fiberglass bust, Maquette of White Ghost (2010). Here, the sculpture conveys a Buddhalike sense of calm, offering respite and solace from an uncaring and hostile world. Reviewed by David Ebony in Art in America.